With the Galaxy S9 and S9+ now in the hands of tech reviewers, some are beginning to evaluate how Samsung's latest handsets stacks up against Apple's flagship iPhone X. One head-to-head shows the S9's Qualcomm Snapdragon 845 CPU, while speedy, is easily bested by Apple's A11 Bionic power plant. In a series of tests, Tom's Guide pitted the Galaxy S9+ against iPhone X, last year's Galaxy Note 8, Huawei's Mate 10 Pro and the Google Pixel 2 XL. In all but one trial — a synthetic graphics test — Apple's custom silicon came out on top, and in a big way. 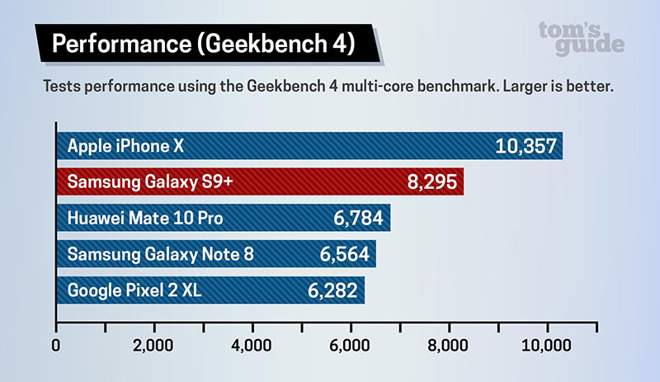 Starting with Geekbench, which provides a decent perspective of all-around system performance, iPhone X came in with a multi-core score of 10,357, while the S9+ placed a distant second with a score of 8,295. Moving on to graphics, Samsung's smartphone managed a 3DMark Sling Shot score of 5,793, outperforming the 3,998 tally put in by iPhone X. Interestingly, iPhone bested the S9+ when running the OpenGL ES 3.0 benchmark in Unlimited mode, scoring 4,994 to Samsung's 4,634. Apple's chip crushed the Qualcomm CPU in real-world testing, as the iPhone took a mere 42 seconds to transcode a two-minute 4K video file to 1080p using Adobe Premiere Clip. The Galaxy S9+ accomplished the same task in 2 minutes and 32 seconds, just 23 seconds faster than Google's Pixel 2 XL. Still, the S9+ is a vast improvement over last year's Galaxy S8, which boasts a Snapdragon 835 processor. The year-old Galaxy model took over 4 minutes to complete the video editing test. Finally, iPhone X took 13 seconds to open the game Injustice 2, a task that took the S9+ 20 seconds. At least part of the speed can be attributed to Apple's integrated software and hardware designs, which are crafted to complement each other.